I love exfoliating my skin. It is a key step in my skin care regimen, there is nothing quite like washing off a face scrub to feel the baby soft skin underneath. Although is an important part of your regime it cant be overdone very easily. There is a very delicate balance that needs to be maintained. Don’t exfoliate often enough is dull, too much and you have painful red skin. Getting the right balance with exfoliation is unique to your skin so some trial and error may be required before you get the balance right. How often you need to exfoliate depends on your skin type. So to reduce the likelihood of over-exfoliation stick with the product instructions and go from there. If your skin is sensitive start slow, however, if it is oily you can get away with more frequent exfoliation. Over exfoliation is becoming somewhat of an epidemic as the use of cosmeceuticals becoming mainstream. The problem is that many people are using multiple products in their routine that contain exfoliating agents. This can happen very easily, so read the ingredient list on your product and make sure. So if you are using a BHA cleanser, then a peeling scrub and toner with an acid or retinol. Your skin is going to let you know it is unhappy because every single item listed has an exfoliating agent. Generally speaking, more exfoliation is good but this can easily tip over into too much of a good thing. Over exfoliation can make your skin go overreact, because so much has been stripped of your oil glands try to compensate by producing oil. One of the main issues is that over exfoliation breaks down your skins acid mantle and this loss of the upper layer disrupts the normal turnover of the skin. If you think this is the case here are some symptoms to look out for. Since the frequency of exfoliation so depends on skin type you can’t really say how much is too much. 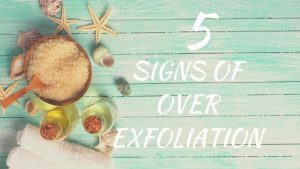 But here are some signs which let you know, you have crossed over to over exfoliation and your skin is not happy. This is the most obvious sign of over exfoliation. Some redness is normal after exfoliation but when it lingers for hours or days that is a sign you have done too much. You may also feel a slight burning sensation when you apply other skin care products, this shows your skin’s barrier has been damaged. Exfoliating regularly is a great way to keep acne at bay especially for oily skin. However, when done in excess, exposes your skin to bacteria which can cause infections because your barrier is compromised. This can lead your developing acne if you were acne free or more acne if it was already a problem. Using a physical exfoliant like scrubs makes the infection is more likely to spread to their parts of your face. Over exfoliation removes the skins natural protection the acid mantle which maintains its barrier function. This prevents your skin from keeping in moisture in, making it dry, tight and flaky. So feeling like you constantly have a mask on or like your skin may crack if you smile too much means you have pretty much stripped away its natural oils. This is much worse for dry and combination skin. You may also notice dry patches, peeling and the need for heavier creams. This flakiness may make you think you need more exfoliation, you don’t. Unlike dry and combination that get drier, the opposite occurs in oily skin. In order to compensate for the dryness from exfoliation, the skin produces more oil in an attempt to rehydrate itself. Stop using any products that you are using to exfoliate your skin. Wait for the symptoms of dryness, flakiness or overproduction of oil to stop before you reintroduce exfoliating to your routine. Starting with no more than once every other day for chemical exfoliants and once a week for mechanical exfoliation. Also, ensure you do not use more than one exfoliating product a day. Depending on the symptoms you have i.e. dryness or oil production use products that can manage or alleviate the symptoms like moisturizing and hydrating masks to help your skin recover. For dry skin, a moisturizing and hydrating mask is helpful to restore and strengthen the skin, barrier, for others use a soothing oil balm with restorative ingredients. Otherwise, leave your skin alone to allow it to heal. Products that contain hyaluronic acid, essential fatty acids, and B vitamins are best to replenish your skin since it has been stripped of its natural oils. It is recommended that you use face oils which have a number of regenerating properties, seal in moisture and hydrate the skin. This is vital for over exfoliated skin as face oils help seal and restore your skin. This should go without saying but is even more important when your skin’s barrier has been thinned from over exfoliation. Over exfoliation makes skin more susceptible to sun damage which can lead to even more irritation. Streamline your skincare routine by using a simple cleanser, a hydrating serum, a moisturizer and face oil. All of this will help your skin’s healing process. In the quest to repair the damage it may be tempting to look for a miracle product or product to undo the damage. There is no such thing, you deal the best thing to do is to leave your skin alone and deal with each symptom if it dry use products with moisture, red and angry use calming products. I have curated a list of products of varying prices which do all or some of what is mentioned above. When dealing with over-exfoliation, time is your friend. With time most if not all the symptoms will disappear, but it is also a hint to listen more carefully to your skin. Ensure you use products based on the instructions and that you stop if it does not fell right. Have you experienced any of these symptoms characteristic of over-exfoliation? Did you use any of teh products mentioned above? let me know in the comments as well as any recommendations.